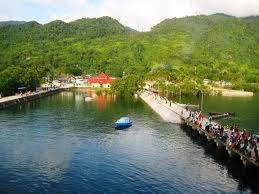 Wekaburi lake is located in the village of Werabur , District Windesi , Wondama Bay District , West Papua Province . Before becoming Telaga Wekaburi , this place is still a small river . However , tersebab by an event , the river was later turned into a lake . Event is it ? Check out the story in Origins story following Wekaburi Ponds ! Previously , in Wekaburi or now known as the Village Werabur , there is a small river where the water is very clear . River water is the source of life for Wekaburi tribe who inhabited the area. The unique thing in this place is the stilt houses owned by local residents built on the river flow . One time , residents will have a party Wekaburi tribe indigenous village . They immediately held a variety of preparations such as building houses for the invited guests , preparing food , and so on . On the appointed day , the invited guests from various tribes such as Tribe Kandami , Wettebosy , Sakarnawari , and arrived in Kampung Wekaburi Torembi . Among the guests in attendance , there was a grandmother with granddaughter named Isosi . Grandma was also accompanied by a dog . When it was dark , custom event began. The show was initially went smoothly and very festive . Variety of dance performed in front of the guests . Many of the guests who participated gleefully dancing . At that moment , a dancer accidentally stepped on the tail of the dog 's favorite grandmother who was fast asleep by the fire . No doubt , the dog was barking loudly . Seeing the incident , the grandmother became angry . He then brought his dog into a room and tie loincloth on his body . After that , he came out , hugging her dog and then dancing with other dancers . The old woman knew that his actions had violated customary . According to custom rules , if there are people who do so will bring lightning , thunder , and heavy rain accompanied . The grandmother was deliberately doing it because they want to give punishment to those who have stepped on the dog . Grandma was aware that perbutannya can create havoc . Therefore , the grandmother immediately took fire butts and bamboo seruas hidden in order not to be seen by others . Bamboo pieces that will be used as a torch . Furthermore , the grandmother took her grandson to immediately get out of the village ." Come , my granddaughter. We soon leave the village , "asked the old woman ." Well , Grandma , " replied Isosi . Lighting a torch to help her grandmother with grandchildren and his dog walked toward Mount Ainusmuwasa through the path . But without them knowing it , a young man named Asya follow their lead . Apparently , Asya is Isosi lover , grandmother grandson ." Wait , Grandma ," she cried . " May I come with you ? " Knowing that the young man was a lover of his grandson , the grandmother did not mind . After that , the grandmother group moved on . Not long after , they arrived at the summit of Mount Ainusmuwasa . From the top of the mountain looks weather began to deteriorate . Dark clouds began to cover the sky above the river upstream Wekaburi . A few moments later , the lightning and thunder seen darting . Heavy rain finally began to fall . Meanwhile , the residents and invited guests Wekaburi still busy partying . They do not realize when trouble is looming . The longer , more heavy rain so there was a big flood . They realized the danger when the water has risen to the floor of the house . Finally hit the panic residents . They ran frantically about to save themselves . However unfortunate , it was too late . The devastating floods that swept away everything . The next day , the grandmother with Isosi and Asya down from the mountain to see the events that happened last night . None of the remaining houses . The same fate happened to the residents . They swept away many , even most of the other transformed into a frog and crocodile . Meanwhile , Wekaburi River has turned into a lake called Telaga Wekaburi later . Until now , the lake has become one of the attractions in the area Wondama Bay , West Papua . As a result of flood events that have swept the entire population made ​​the grandmother feel very satisfied . " That's the result of your actions ! You've stepped on my pet dog , "said the grandmother . The grandmother then marry Isosi with Asya in the hope that one day their grandchildren will fill the empty Wekaburi it . After marriage , they then build a big house and a long -named Aniobiaroi . Several years later , gave birth to many children Isosi so the house was becoming increasingly crowded . " Well , we 've packed the house , my wife . This house should we view again , "said Asya . " True , Kakanda . This house should we extend and enlarge again . "Replied Isosi agree . Aniobiaroi home finally connected again so getting bigger and longer . The house was then given the name Manupapami . Several years later , the house was again crowded . Children as well as their daughter continued to have many offspring . So , Asya also took the decision to connect Aniobiroi home . The house was then given the name Yobari . So forth , their house is still not able to accommodate the whole family . Therefore , they connect the house up to four times that of each house named Sonesyari and Ketarana . Although it has been four times jointed , their house still crowded. Finally , they decided to find a new place for some residents and build a house for every family . Thus the story of The Origin of Lake Wekaburi Wondama Bay , West Papua . The moral to be learned from the story above is that the case no matter how small can bring a bigger problem . Just because a dog belonging to a grandmother stepping , resident Wekaburi must accept the consequent floods washed away . Therefore , we must always be careful not to disturb other people , either intentionally or unintentionally .